In September 2013, the English Football League embarked on a project to fundamentally transform the online experience for football fans and reporters alike. 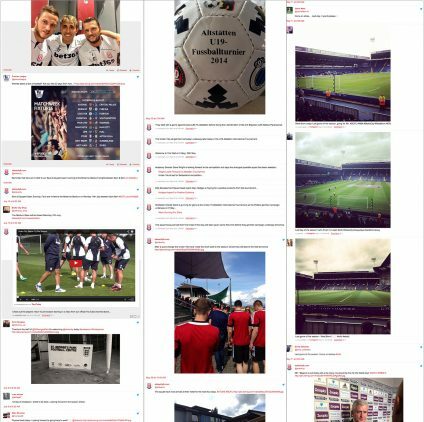 A cross-section of twelve clubs from the Premier League and Championship League (Barnsley, Bournemouth, Birmingham, Colchester, Coventry, Derby, Exeter, Gillingham, Hereford, Oxford, Stoke City and West Bromwich Albion) volunteered to participate in a pilot of ‘The Wall’ – a hub for club-related news and fan engagement. The goal: to reach a larger audience, provide frequent updates to fans and to increase the amount of time readers spend on their sites. After a one-day training session the implemented Walls were handed over to the club’s’ digital teams. Depending on the club’s’ size and budget, teams ranged from a small group of social media-savvy journalists to teams of one where a team’s caretaker would live blog as well as wash the players’ kits. ScribbleLive’s social media curation tool served clubs with fewer resources well: using the club’s hashtag and user auto follow feature, they were able to automatically feed in relevant newsbytes or photos. In addition they were able to share social media conversations and keep the content on their Walls fresh. The participating twelve clubs succeeded in uniting their widespread digital activity into one ongoing narrative. The attempt didn’t go unnoticed by fans: in the three-month trial period alone, the average time on page increased from 1 minute 20 seconds to 3 minutes and 42 seconds – two and a half times longer than before. Fans began to visit The Wall not only on match days but to return several times a week to check for updates on their favourite team. Not having to manually screen the various social media channels proved especially valuable on stressful match days as it gave the clubs’ reporters the chance to focus on delivering live updates from the stadium. Similarly, the easy, mobile-friendly publishing process worked in the club’s’ favour. Videos proved particularly popular: using the ScribbleLive mobile app, reporters were able to record and upload impressions from the sidelines or exclusive behind-the-scenes material straight onto fans’ mobile phones or share videos via Vine or YouTube. Following their positive experience with ScribbleLive, the 12 participating clubs became ‘ambassadors’ for the English Football League’s transition project, helping the remaining 78 clubs with on-boarding for a total of 90 sites. Additionally, two more Walls were created: Westbrom Albion’s international Wall as well as the English Football League’s own Wall, which is used to curate highlights of the teams’ engaging content.